The international master championship of Bao consists of four tournaments. 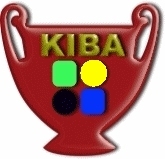 A final master (Mabingwa) tournament of the best players will announce the first Bingwa KIBA (KIBA Bao Master), BK. The KIBA championship also provides a ranking by nation. All subscribers to the site www.kibao.org can participate in each of the four tournaments. A player gets 1 point for the championship for each match won in the qualifying round. A player gets 2 points for the championship for each match won in the semifinal round. Finalist player gets 3 points for the championship. The winner of the tournament gets 4 points for the championship. At the final master (Mabingwa) tournament participate the best six players in the championship. The six players will compete in a single round. The first two players classified will play the final of the championship. KIBA will award the title of Bingwa wa KIBA (Master of the KIBA) to the winner of the championship. At the end of each tournament is also compiled a ranking by countries. A country can enter that ranking if it has been represented by at least three players in the concerned tournament. For each country the best four scores are added together. The first two countries in the standings of each tournament will participate in the tournament for countries. The three best players of each countries will play in the tournament..
Each player will play a game against all other three opponents. A player gets a point for each match won, the winner country will be the one with more points. First tournament: May 1, 2013. Third tournament: November 1, 2013. Fourth tournament; January 1, 2014. Final Master (Mabingwa) Tournament: March 1, 2014. The organization reserves the right to make amendments to Regulation during the championship. For matters not covered by this regulation, please refer to KIBA Online Tournaments rules.